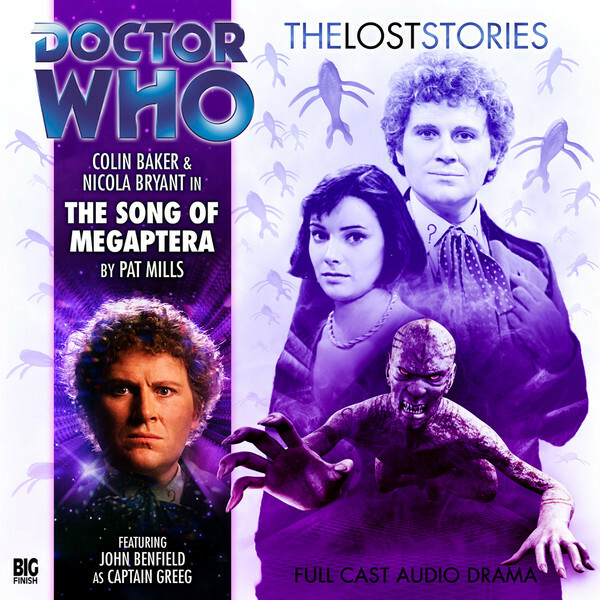 ‘The Song of Megaptera,’ originally titled ‘The Song of the Space Whale,’ has one of the longest and most intriguing journeys of a Doctor Who script to ever make it to production in any form. Originally written for Tom Baker, rewritten for Peter Davison, and rewritten once more for Colin Baker, this story from the pen of Pat Mills never managed to make it to screen for any number of reasons, budgetary constraint given the fantastic setting likely a major one. Nonetheless, Big Finish has finally allowed the well-traveled and oft-rewritten script to come to life as an adaptation of the Colin Baker version of the Doctor and his companion trying to stop the pursuit of miles-long space whales throughout the cosmos, unhindered by the original revisions script editor Eric Saward had suggested for the time. With that in mind, it’s perhaps unsurprising that ‘The Song of Megaptera’ is hardly subtle about its ecological and anti-whaling viewpoints. And while the story does take a very whimsical turn midway through, this is absolutely a story that could have worked just as effectively upon Earth’s oceans given just how overt that message is. Nonetheless, in a time when ecological groups hold political weight and individuals can be convicted of ecotage, the setting certainly adds an extra dramatic weight to proceedings and resonates with the increasingly environmentally-friendly views of the majority of the world. Of course, a Doctor Who tale of its time would never be quite so straightforward, and the fact that these space whales draw energy from suns with their solar scales and can attempt to escape pursuit by diving through the event horizon of time is quite fascinating. Likewise, the TARDIS inadvertently impeding the pilot whale’s ability to navigate, thus putting thousands of others in danger as well, is a novel means by which the Doctor becomes directly involved in events. Yet while it’s also quite intriguing that the Galeen are ferries for wayward castaways who live amidst the debris of wrecked ships within it, the ‘framily’ of survivors who purge unbelievers from their safe harbor doesn’t quite capture the same sense of imagination as the premise may suggest. The small cast does well with imbuing an ethereal sense of oddity and danger to their situation, but the portion of this portion of the plot is simply too straightforward and predictable to successfully resonate in any meaningful fashion. On the other hand, Mills seems to have a firm grasp on the more verbose Sixth Doctor who revels in every opportunity he gets to take command and impart knowledge. While it would undoubtedly be intriguing to see how the earlier two incarnations of the Doctor would fare in similar circumstances, the Sixth Doctor is a natural fit for these topical events and Baker is gives a monumental performance in return. At the same time, although Peri is written as being a bit more confrontational than is typical, she is the perfect companion to remind the Doctor of his responsibilities regarding the space whale as her love for the natural world shines through spectacularly. ‘The Song of Megaptera’ is a fairly straightforward story that stays true to its initial exposition and intent. Though not necessarily drenched in the atmosphere of some the earlier releases in this range, the story retains an intriguing mix of characters and settings that, along with strong direction, help this ecologically-driven narrative maintain a quick and entertaining pace while successfully bringing the Galeen to life after so long in unproduced purgatory.